Never been to a House Concert before? A “House Concert” is exactly what the name suggests: it’s a concert in somebody’s house. Joanne & Joe Smiddie-Brush host the “Flying Cat” House Concert Series in their home in the Broad Ripple neighborhood of Indianapolis. It’s important to clarify that it is a concert; it is NOT a party with background music. 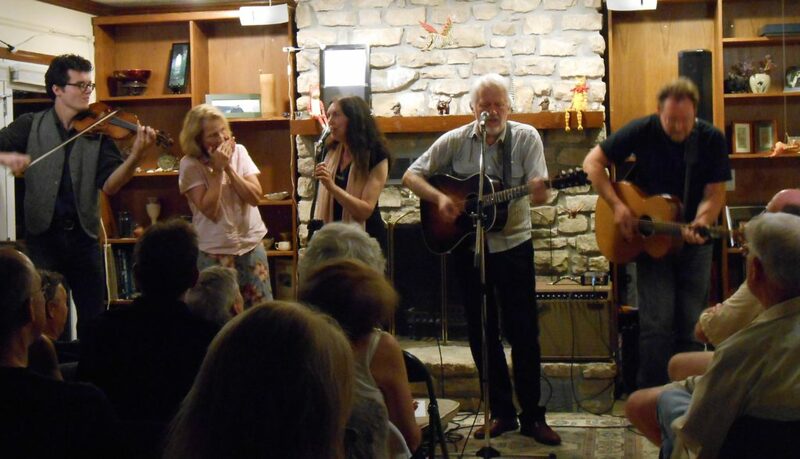 Our house concerts are a great opportunity to hear acoustic music in an intimate, informal setting, while spending an enjoyable evening socializing with friends. The fact that it takes place in a private home contributes to the intimacy and warmth of the occasion, from the perspective of both the artist and the audience. What happens at your house concerts? People begin arriving about an hour before the start time of the performance. Guests are invited to bring a snack to share (finger food works best) and may bring beer or wine. As hosts, we provide plates, napkins, wine glasses, bottled water, and all the other amenities. Guests mingle and socialize in the kitchen/dining room for a little while before the show starts, and if the weather is nice, people often go out onto the screen porch or deck. It’s casual, laid back atmosphere, and everyone is looking forward to the concert. Social Hour is a great way to meet people. When it’s time for the show, everyone moves into the living room, where — using couches, a lot of mismatched folding chairs, and a few stools — we have arranged the room to seat as many people as possible. There is a bit of last minute scrambling to get everyone seated, but it always works out. Once everyone is comfortably settled, our MC makes the standard announcement to “put your cell phones on stun,” introduces the performers, we dim the light just a bit, and then the concert begins! We normally have two sets of about 45 minutes with a break in the middle. During the intermission there’s a chance to mingle with the artist and your fellow music lovers, and refresh your beverage. Performers often have CDs, T-shirts, etc. available for purchase. No, sorry. Seating is limited and reservations are required, and we arrange the seating based on the number of people we are expecting. Some of our concerts fill up very quickly and have a waiting list, so it is best to RSVP early. Reservations are taken on a first-come, first-reserved basis. If you are on our e-mail list, you can simply use the RSVP button in the announcement. Send us an e-mail: FlyingCatConcerts@gmail.com. Visit the Upcoming Concerts page, and use the RSVP button for the specific concert you wish to attend. NOTE: You’ll receive a personal (not automated) response, depending on whether you have ever attended a concert here before, have attended one concert, or many. Please allow up to 24-48 hours for us to respond. No matter how you choose to RSVP, be sure to let us know which concert you’ll be attending and how many in your party. Please be aware that if you RSVP for a concert, we are holding a spot for you, and counting on your attendance to compensate the artist. Please do not RSVP unless you plan to attend. Where is the concert? I can’t find your address! We are located in the Broad Ripple neighborhood of Indianapolis. Because this is a private home in a residential neighborhood, we do not publish our address, but we’ll gladly provide you with the address and directions once you’ve made your reservation. Do you sell tickets in advance? We do not actually sell tickets for our house concerts, as this is not a business. 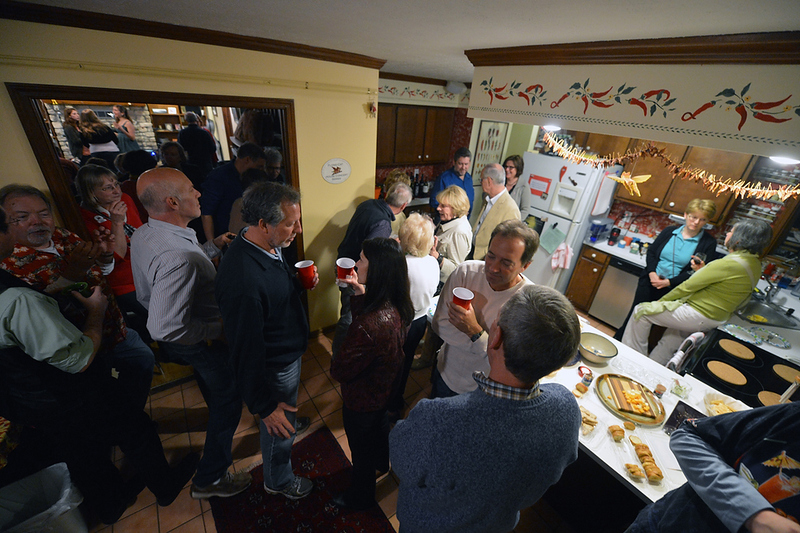 It is a gathering of friends and neighbors who enjoy live music and friendly conversation. There is a $15 -$20 per person suggested donation — we put out a jar in the kitchen/dining room and basically use the honor system. Guests are encouraged to visit the jar in order to compensate the performer for the evening’s entertainment. All of the money that is collected in the donation jar goes directly to the artist who is performing that evening! There is separate basket available should anyone wish to make a contribution to the “house” to help defray the costs associated with running the series, such as maintaining the website and our annual membership in Folk Alliance International. What if I made a reservation, but can’t make it to the show? If for any reason you cannot attend, please let us know as soon as possible. Our concerts are sometimes “sold out” with a waiting list, so if we know in advance that you’re not coming, we can give someone else a chance to attend. We are a “listening room” venue during the performance. No phone calls, texting, or talking during the concert! Plan to arrive AT LEAST 15 minutes before the concert is scheduled to start so we can get everyone comfortably settled before the music starts. Latecomers interrupt the performance, and no one wants that! No smoking inside. Guests make smoke outside provided they are courteous to those who are nearby. Isn’t this a lot of work? Why do you do this? Well, yes, it is a lot of work….but it’s also a LOT of fun! We get to experience the joy of having wonderful performers play music in our living room! Hosting the “Flying Cat” House Concert Series has been an incredibly rich and rewarding experience, one we wouldn’t trade for anything. We’ve developed great relationships with performers here in Indiana and around the country. We’ve made new friends with people who share our love of acoustic music – from here in Indianapolis and as far away as the Netherlands. Our guests tell us that they really enjoy attending our House Concerts because they can experience the music they love in a relaxing environment, have the opportunity to talk to the performers, and meet new friends. How frequently do you hold concerts? How long have you been doing this? Our first concert was in 2009, and since then we have hosted about six to eight concerts a year. Please see the Previous Concerts page for more information about past concerts. How do you find performers? Lots of ways! Primarily, we go out to see local, live, acoustic music. OFTEN! (Seriously, we’ve been known to attend three or more different music events on the same weekend.) After the show we introduce ourselves to the performers, and ask if they’d be interested in playing at our House Concert series. Really, it’s that simple.Performers are looking to play venues where people are there to actually listen to the music, and many are eager to play House Concerts for that very reason. We also attend Folk Alliance International conferences, travel to nearby concerts and festivals, and are on the Board of Directors for the Indy Folk Series. All of this gives us more than ample opportunity to meet very talented performers. Do your cats really fly? 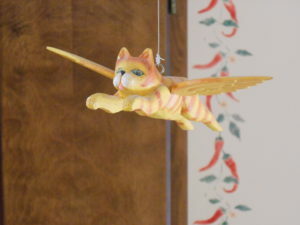 One of several “Flying Cats” in our house. Not exactly! Many years ago, while visiting friends in Atlanta, we visited a shop with a wide array of all kinds of brightly painted wooden creatures with wings – frogs, pigs, dogs, horses, and of course cats. One of the winged cats reminded us of an orange tiger cat we had at the time, Fritti. We brought the flying cat home, hung him in the window, and didn’t think much more about it. But every time friends came over they always asked about that flying cat! Everyone loved it… and eventually we began to accumulate a few more. That original orange tiger cat hangs in our kitchen. We have quite a few flying cats, in addition to the big striped flying cat that hangs over the stage during every concert, scattered around the house. See how many you can find next time you are at a concert. We also have a cat, named Talisker. He does not enjoy the concerts as much as we do, and prefers to stay upstairs when we have a house full of people. If you stick around for a bit after a show, he will probably make an appearance after most people have left. Which concert has been your favorite? Well now….that would be like asking us to choose a favorite cat, wouldn’t it? 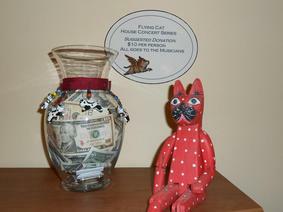 The “Flying Cat” House Concert Series is an official Folk Alliance International House Concert Venue.